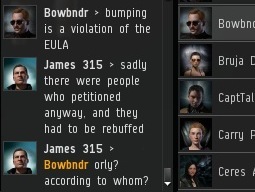 No matter how long my bumping business has been active, and no matter how well-known it may be, there are always miners who think they've come up with a legal maneuver to finally get me permabanned from the game. Despite the fact that I've been the target of numerous petitions, miners tend to assume that their petition will be the one to get me banned. As we saw with the misinformation about orbiting to avoid bumps, miners love to authoritatively say things that simply aren't true. 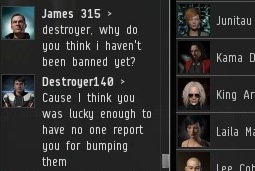 The obvious question miners should be asking is, "If this is against the rules, why hasn't he been banned yet?" 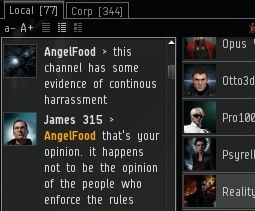 A miner who has never spoken to a GM or seen any evidence about what constitutes a bannable offense will nevertheless assume his interpretation of the rules must be correct. If a miner can read a rule and apply it to something he doesn't like, that must be the way the rule is enforced. He can't imagine not getting his way. Often, miners will "prove" that their interpretation of the rules is correct by simply quoting the EULA over and over, pasting the text into local. If you're lucky, though, they'll come up with some creative explanation for why the rule hasn't been enforced to their liking. 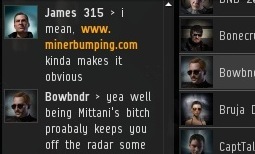 Remember, if you haven't been banned for inconveniencing a miner, you have The Mittani to thank! 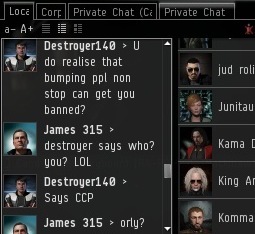 I did not realise that Mittens had so much influence that he'd be able to specifically spare people who only bump hi-sec miners from being banned. TIL. People are so ridiculous. You think they'd learn by now. Not at all. I had virtually the same discussion with a bunch of miners in Kino today. All hail mittens, for he will save us all from the wicked CCP.